OPINION. Is 'turf invasion' in the motoring world a mistake? When Mercedes first launched the A-Class in 1997, the company ventured into a segment that was quite a ways off their natural element. At the time, the motoring epitome of luxury and innovation launching a rear-wheel drive hatchback was unthinkable. And yet, they did it. However, the marketing team soon realized that positioning the A-Class as a luxurious everyday car was pretty lame, and thus they came out with the ‘safest hatchback in the world’ tagline. The idea was to convince the affluent to purchase this new kit for their coming-of-age offspring, and getting them into a more economical, safe, quirky Mercedes would be a no-brainer. Of course, the slogan clashed slightly with that of Volvo, which for years had invested endless PR dollars to position the brand as ‘SAFE’. In capitals. This was their turf, and as powerful as Mercedes was, they was not going to let it go. What Volvo did is purchase a bunch of A-Class Mercedes, subject them to an endless battery of tests and found that, if you turned the wheel left while accelerating and braking on Grade B tarmac whilst at the same time opening the passenger window, the Merc could sometimes topple over (Moose Test and old school Clarkson at 1m 16s in above video). Tsk, tsk, so much for safety. Of course, officially, the test was conducted by a magazine, in Stockholm, and was called the moose test, but we can easily gather where the strings were being pulled from. So damning were the results, they actually forced Mercedes to modify its design, costing a fair bit of dough and a few heads, and in the end, the A-Class had to be marketed as a ‘bit more luxurious hatchback’. The experience taught a valuable lesson: do not piss on another’s turf or you will be clobbered. Given its seemingly ever-expanding line-up, it probably won’t surprise you to learn that this is not the first time Mercedes has been at the heart of such turf ‘invasion’. Blink and you’d probably missed it, but in 1994, as Mercedes was recovering from the A-Class retooling debacle, BMW purchased Land Rover, then goes and launches the X5 in 1999, aiming it straight into the waterline of Mercedes’ M-Class, an already tired model. Sales go through the roof with 38,000 cars shifted by 2000 and thus matching Merc’s sales. Not bad for a first year. In response, Mercedes, huff and puff, and launch the E63 AMG in 2003. Aiming for BMW’s flagship M5. Nein, Nein! Before long, Blackberry decorator and Beetle spoof manufacturer Porsche had spotted the opening too, making it a three-way affair. In 2003, they went North to Wolfsburg, met with Audi-Volkswagen executives, did a Powerpoint presentation, and the Volkswagen Cayenne / the Porsche Touareg was born. But where Mercedes was left with scuffed knuckles following the A-Class launch, Porsche, not contented with this affront, went even deeper into enemy territory. In 2009, Porsche came out with the Panamera. Granted it wasn’t the first time had Porsche tried its luck in the four-seat saloon: in 1977 the company released the 928, which was quite good, quite fast, quite expensive and quite unsuccessful. Blame it on the price, blame it on the oil crisis but the reality is that in its 18 years of life they made 62,000 units, or less than 10 a day. The Panamera, on the other hand, was well positioned, well made, properly priced and, as a result, it has managed to contribute between 15 and 20 percent of Porsche’s sales figures so far. Not bad at all. The problem here is that Porsche elbowed its way right into Mercedes’ core, namely the luxury saloon. 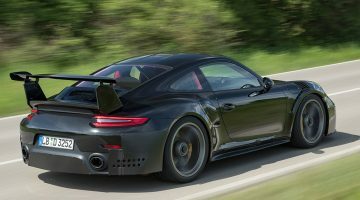 And make no mistake, Porsche may claim its focus is on ‘sporty driving’ and whatever, but they also make diesel versions of these two cars. Whichever way you slice it, Porsche kept one eye on performance and luxury, and another on the cash register. Nothing wrong with that, of course. Still, it’s no coincidence that in 1999, Mercedes purchased 51 percent of AMG, completing the acquisition in 2005. Since then, every Mercedes car has an AMG version, competing with everything BMW did, and funnily, with Audi, who until this point had been happily trudging along (guess what, Audi got into the fray with the Q7 in 2005). It wasn’t too long before Mercedes looked at the 911 and designed a crushing strategy against Porsche. If history has proven anything then, it’s that, surely, there is more to come, and more rival territories to encroach. For us, the more the merrier: can’t say I object to this open battleground as it normally translates into technological revolutions, and we are certainly due one. We could argue that poking a sleeping bear is a dangerous strategy – Mercedes proved as such in 1997 – but in the current climate we can only escape forward. Just look at Tesla, the new all-electric kid on the block in the Middle East that’s already starting to extend its line-up, across several market segments, determined to make a dent. Makes you wonder just how Mercedes, Porsche and BMW will react to that. Enjoy this ‘ Turf Invasion ‘ story? Next Article The Hottest GT-R from Los Angeles to Dubai. Rocket Bunny Pandem.